I did a lot of driving the other day and was entertaining some lines of thinking–notably, that I have lots of tattoos, and yet I’ve never regretted any of them. I thought about how each time I’ve wanted a new tattoo, I’ve researched, selected an artist, and made the decision to work with them. So, while this blog post may be a bit self-serving (because, in this case, I’m the “artist” delivering consulting services), there are so many parallels that it’s uncanny. From a Salesforce and technology consultant’s perspective, the premise of the analogy is this: IT projects are like a tattoo on your career. Do you want to have a bunch of bad ones in your body of work, or do you want to have a series of successes? I was reviewing some metrics the other day and realized that our team has delivered 575 projects now. That’s a lot of projects, and a lot of experience. 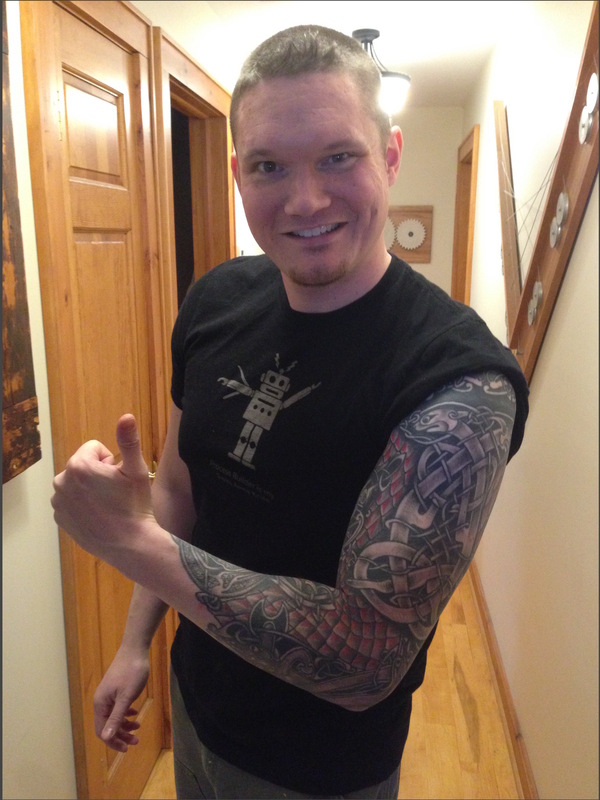 During that same time frame, I’ve had 11 tattoo sessions, and I’d go so far as to say that my tattooing philosophy applies to the work we do as Salesforce and technology consultants, too. Don’t hire the cheapest artist. (Self-serving indeed!) But seriously, would you want to hire a bargain basement artist who tattoos you in their kitchen, or do you want to go to the artist whose studio looks like a dentist office? We’ve all heard the expression, “You get what you pay for,” and there is a lot of truth to it. The best talent is not ever the cheapest. Good artists have a schedule. It’s tough to go to a tattoo artist and tell them that you need your sleeve done by next week. Good artists have a backlog of clients and project work that they are focused on satisfying before accepting new work, particularly new work that has a lot of contingencies. They pick you as much as you pick them. When I decided to work on the series of tattoos that would become my sleeve, I researched and found an artist I was interested in working with. Our first conversation was not about how much work he could do and for how cheap, but, instead, about how we would work together throughout the process and making sure he understood my vision. We discussed expectations, and I assured him that I was “as good as my word” as a client. He also appreciated that I would be organized and punctual. A good tattoo artist will be selective about who they choose to work with–and it’s similar with us Salesforce and technology consultants! Do your homework, be organized, and be punctual! I get the impression that nothing is more frustrating to a tattoo artist than no-shows, late shows, and folks that show up and have no idea what to do. As much as an artist strives to deliver great work, they need participation on the client side in order to produce awesome results. As a tattoo artist, the responsibility of creating a permanent piece of art on someone’s body is a huge one. And as Salesforce and technology consultants, we have a responsibility to deliver true solutions that will help your business run smoother, more profitably, and just plain better. Both are important relationships that depend on a smart and thoughtful selection and collaboration process. I hope you’ll consider us at Red Argyle when you’re ready to get a tattoo Salesforce or technology support from an artist who is truly invested in doing things the right way.